Maud’s was a down-to-earth watering hole nestled in San Francisco’s Haight-Ashbury since 1966. As the Counter Culture matured, Maud's came to enjoy an international reputation as the quintessential meeting place for non-conformist women and their friends. Last Call at Maud’s is a 77-minute historical documentary that goes into the world’s longest lasting lesbian bar as it bids farewell to those who have known it through the years. In September 1989 Maud’s served its last drink. Last Call at Maud’s uses this significant moment in San Francisco’s extensive bar culture to explore various facets of gay women’s history from World War II through the 1990s. As we make the rounds at Maud’s goodbye party, we’re taken on a journey into the past, as people remember the personal paths leading them here for this special last call. Their voices and an array of precious visuals (including rare photos, home movies and historical archives) take us on a tour of the American lesbian experience unlike any other on film. Maud’s owner, Rikki Striecher, fondly recounts her introduction to women’s bars during their World War II urban heyday. Her candid stories and vintage photos of this secret sorority reveal a long-hidden side of female culture. Rikki Striecher out and about. 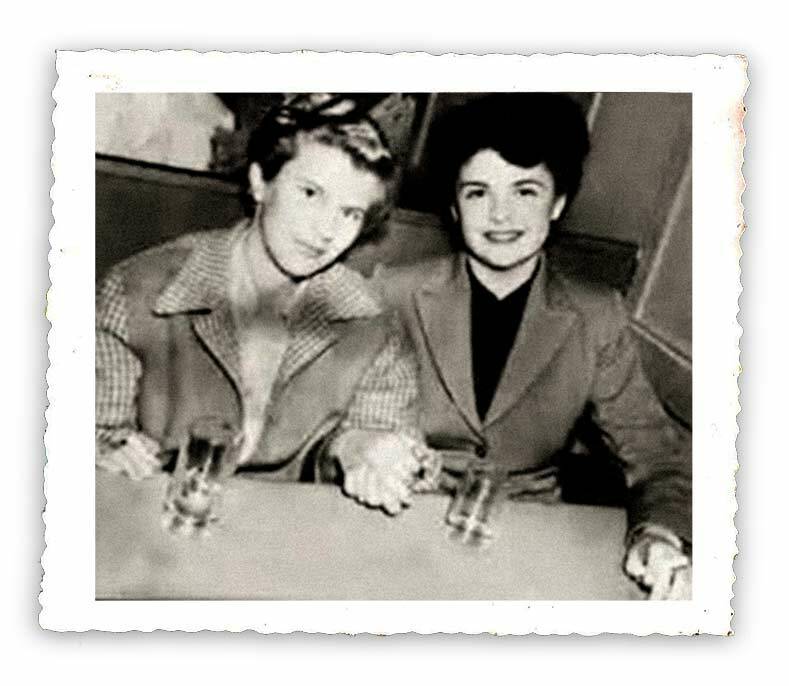 Del Martin and Phyllis Lyon, founders of the Daughters of Bilitis (the world’s first international lesbian organization), describe how a climate of fear permeated their 1950s and early 1960s underground world. They bring us back to a pre-Stonewall reality, when gay bar raids were a frequent pastime of police across the country. San Francisco’s police commissioner, Gwenn Craig, brings us up to date as she talks about gay bars and discrimination in the 1970s and 1980s. Maud’s popular bartenders say they saw it all – passionate affairs, undercover detectives, emotional arguments and drunken brawls. They also tell us they’ve seen shifts within the lesbian community toward public visibility and healthy sobriety. Teacher and activist, Sally Gearhart, treats us to her fascinating account of San Francisco’s volatile radical feminist movement. Writer Judy Grahn explains the links between the early gay bar scene and the evolution of today’s queer culture. Author JoAnn Loulan shares her provocative insights on sexuality and gender. And a variety of Maud’s customers remember the past, ponder the present, and predict the future for themselves and their community. In early 1989, after years of post-graduate film study, Paris Poirier noticed that there was something missing in the thousands of films she had watched: A believable, sincere lesbian point of view. Though sapphic characters appeared in movies every now and then, she felt that they never were in clear focus. Being plucky, if somewhat impractical, Paris took it upon herself to rectify this situation. Her initial idea was to make a verité documentary of a young dyke out for a night of San Francisco bar hopping. Paris began pre-production, but before she had gotten very far, she was told a deep secret by a dear friend: The "Mother" of all lesbian bars -- Maud’s -- was closing down. In a split second Paris realized that telling the story of Maud's was the ideal concept. After all, Maud's had enjoyed an international reputation among the gay underground of the 1960s & 70s, and it was the very first place Paris headed to the Summer of '78 landing alone in San Francisco from Boston. After speaking with Maud’s owner, Rikki Streicher, Paris approached a former student of hers from San Francisco State University's Broadcasting Department. A gifted cinematographer, Cheryl Rosenthal, assembled a volunteer crew and oversaw the technical needs of the shoot. David Bolt, then executive director of The Bay Area Video Coalition, agreed to have BAVC sponsor the project. 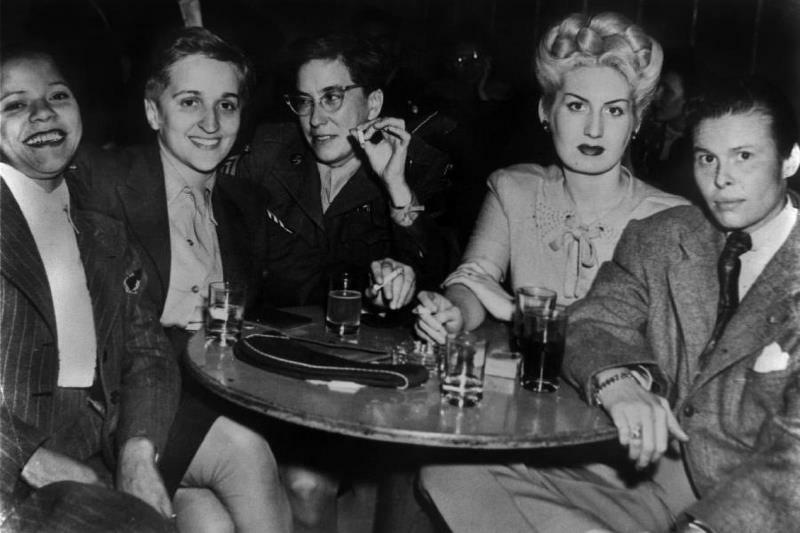 Karen Kiss (a whiz at research) became the fledgling film's producer, and emphasized the need for a range of interviews to explore the significance of bars in queer culture, so Paris invited a diverse ensemble of lesbian luminaries to pay one last call at Maud’s. By the time Maud’s served its last drink, Paris had thirteen hours of fascinating footage ready to be edited. Little did she realize how daunting the road to completion and distribution of an indie film would be. With footage in the can, grant writing began in earnest. Needless to say, The Bush Years of 1989-92 were not robust with financial support for gay projects (particularly so for a non-fiction film set in a lesbian bar made by a first-time director). Intermittently, though, "the impossible" happened and each small grant awarded meant that more archives could be shot and works-in-progress shown. The research process grew exponentially. Historical collections were combed and personal treasures unearthed. In all, over 700 archives were shot and close to 400 are in the final cut. Last Call at Maud’s was shown as a work-in-progress at six public screenings, including the 1990 Independent Feature Project in New York City, and the 1992 San Francisco Lesbian and Gay Film Festival. Increasingly it became clear that while the majority of funders were not interested in supporting this quirky film, audiences undoubtedly were. In November 1991, Maud’s owner, Rikki Streicher, closed Amelia’s – San Francisco’s last permanent lesbian bar. Paris came from Los Angeles to shoot the closing for inclusion in the film. Though it was ultimately decided that no other live-action footage be in Last Call at Maud’s except for what was in and around Maud’s itself, the Amelia’s shoot provided a list of two-hundred names attending that last call. Paris developed a simple fundraising strategy of appealing directly to the target audience. She offered each and every one a chance to donate, and in return, their names would be included on the Last Call At Maud's credit roll. The “on-screen/coming-out” pitch was on. For $100, you could put your name on the credit roll. For $200, you got a second name on the credits and a copy of the fancy, feature-length VHS videocassette. A unique direct mail campaign began. Mailers were sent out ten times throughout 1991-92. In all, over 18,000 fundraising pieces were processed, using Frameline and Naiad Press mailing lists. About eighty people, from Alaska to New York, responded with a donation (some of them in the form of 5 dollar bills). Not resounding, but encouraging, and generating just enough funds to get through rough-cut editing. Then came the BIG BREAK. After seeing Last Call at Maud’s as a work-in-progress at the 1992 San Francisco Lesbian and Gay Film Festival, Sally Jo Fifer, Executive Director of Bay Area Video Coalition, suggested Paris apply to BAVC’s upcoming Artist Equipment Access Grant. Paris was awarded their highest prize and a $10,000 post-production bill was automatically paid for. There were some aesthetic decisions that were clear to Paris from the start. No narrator. (Believe it or not, this was an unconventional notion in the late 1980s.) Paris was certain that the traditional “voice of authority” would just get in the way of the aural magic the on-camera participants provide on their own. No character identification (until the end of the film). Paris wanted this particular cinematic experience to feel like a night in a bar...a bit anonymous, but no less deeply topical and emotional. No newsreels or stock footage – Each memory conveyed through a frozen moment in a photograph or Super 8 home movies. Paris decided to strive for a balance in terms of the personal, the political and, above all, the humorous. Because Maud’s was a “talking bar”, Paris let the conversation dictate the film's structure. Last Call at Maud’s emulates a night in a bar – it starts out a bit on the shy side, everyone finally warms up, and before you know it, it’s last call. World Premiere at the Castro Theater 1993. Director Paris Poirier. Last Call At Maud's premiered at The Castro Theatre in San Francisco and at The Berlin International Film Festival in February, 1993. It went on to screen in more than two-hundred venues across the United States, Canada, and around the world.